Hamilton Island maps, travel information, climate, shopping, location, getting there. Hamilton Island lies on the same tropical latitude as Honolulu in the northern hemisphere and Mauritius in the south. It has a year round warm tropical climate with an average temperature of 27.4 degrees celsius. Its maximum summer temperatures (December, January and February) are around 30 degrees celsius, with maximum winter temperatures (June, July and August) around 23 degrees. Hamilton's tropical climate means the days are warm and the atmosphere is very relaxed. A light jacket or sweater may be required for evenings during the cooler months. Beachwear and casual attire is suitable during the day. Hamilton Island hosts Australia's largest, oldest and richest outrigger canoe events attracting more than 1000 competitors from all over Australia, Hong Kong, New Zealand, Fiji and Hawaii. Annual event in May/June. 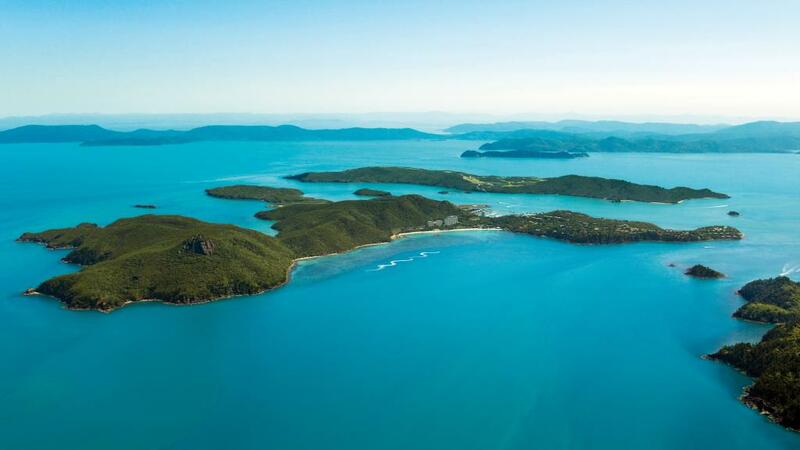 Hamilton Island Race Week is Australia's largest offshore yachting event. It consistently attracts record numbers of competing yachts both nationally and internationally. Annual event in August. The ultimate food and wine weekend in the ultimate tropical location. Hosted by Len Evans OBE, with an array of expert chefs and winemakers, this event is a foodies delight. Annual event in June. Please note these dates are subject to change without notice. The complimentary resort shuttle services approximately 80% of the island and operates from 7am to 11pm daily. Alternatively buggy hire is available on the island which is the main mode of transport. If you are staying in one of the Holiday Properties then a buggy is included in your rate. Hire prices start from $85 per day. A drivers licence must be held and drivers to be aged 21 years or older to be able to operate a buggy on the island. Virgin Australia offers direct to Hamilton Island from Brisbane and Sydney with connecting flights from Melbourne. Virgin Australia also fly to Proserpine Airport and Mackay Airport, which are the closest mainland airports to Airlie Beach. From Proserpine Airport there are transfers available to and from either Shute Harbour or the Port of Airlie to meet launch transfers which operate to Hamilton Island Marina. Hamilton Island features fantastic shopping with 20 boutiques and specialty stores throughout the Marina Village and resort centre, including general store through to local art and fashion. Forget the mobile phone, leave your watch at home, no razor scooters or skateboards, but do remember to bring along swimming costumes, sunscreen, sun hat, light weight/water proof jacket during the cooler months, day pack, comfortable walking shoes, smart casual attire for dining out, and the book you've been meaning to finish! Check in time is 2.00pm. If you are arriving on a flight before 2.00pm, we recommend that you carry a 'day bag' with swimming costumes etc. Lockers, change rooms, and shower facilities are available in the Hospitality Lounge which is located in the lobby of the Reef View Hotel. Guests will only be granted access to their buggies if they present a full and valid driver's licence. The Buggy and keys must be returned along with the room key on check-out at 11.00am. Credit card details will be required on arrival to set up room charge accounts. Please note charge back facilities are not available for guests staying at Hamilton Island Holiday Properties. Cockatoos are natural island inhabitants, please do not feed these birds as this interferes with their digestive system. Please keep all doors and windows closed to reduce the likelihood of these birds accessing in room items. If scuba diving is on your agenda, please bring along a medical certificate, or if more advanced proof of diving certification is strongly recommended.